Register programs are similar to pinups in one important way and different in two distinctive ways. First, they are similar in that they fall under the umbrella of point-of-sale (POS). For me, POS cause marketing is anything that happens at a business' register that raises money for a nonprofit. In addition to register and pinup programs, I would put round-up programs and donations boxes under the point-of-sale umbrella. Register programs differ from pinups in that they are generally passive cause marketing - which means there is no ask from the cashier (e.g. "Would you like to donate a dollar to the One Fund Boston?"). Beyond seeing the signage at the register - or on the credit card terminal when they swipe their card - the customer acts on their own without any prompt from the cashier. Pinups also involve some type of paper icon that shoppers sign and is then displayed in the store. You'll find a lot of examples of pinups and register programs (and donation boxes) on my point-of-sale board on Pinterest. Working with a business' point-of-sale system (i.e. In this case the actual register a business uses to process sales), you can quickly set up a register program without going through the work of designing, printing and shipping pinups. And that's just what we saw in the days and week after the bombing here in Boston. Here are several examples of register programs. This one is from Dunkin Donuts. There was no ask from the cashier. I saw this one at Shaw's/Star supermarkets. This company - one of the larger supermarket chains in New England - made a generous donation to the victims and offered to match donations up to $100,000. The manager at my local Shaw's, Neil Coutu, kindly let me photograph the instructions for cashiers. While I wasn't asked to support the victims, employees are encouraged to ask customers to give. Also, note how they processed payment with a code. Other businesses will use a barcode or designate a button on the register for the transaction. I got this ask from CVS Pharmacy after I swiped my credit card. The first time, it only appeared for a second before disappearing. The second time I shopped at CVS I had to make a donation (or choose NO) before proceeding. I've said before that if the cashier isn't asking you to give this credit card ask that requires a response may be the second best thing. Register programs have always been popular at Whole Foods. I see a different one every month. I've never been asked to give, and this register sign states that shoppers should tell the cashier how they would like to donate. The big questions with register programs, including this one, is how much will they raise? Will Shaw's even get close to matching $100,000 in donations from shoppers? I suspect not. We know that compared to active cause marketing - when the cashier asks the customer to donate - there's a large gap in how much is raised. Without a verbal request, most customers won't give. Still, these register programs will raise some money. They're also useful in that they tell consumers what the company is doing in the aftermath of the tragedy. 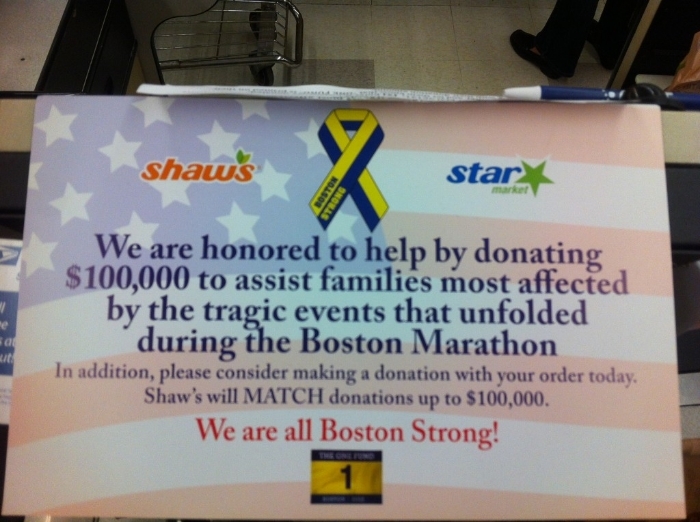 Shaw's is smart in promoting its donation, and encouraging others to make theirs, which they'll match. Even if shoppers don't donate they'll leave knowing Shaw's did.